Have you heard of the Ketogenic Diet? I've done some research and found that it is very low carb, high fat and moderate amount of protein. So basically what I usually eat, except more fat and no fruit or honey. And since my body is an ongoing science experiment, I thought I'd give it a try. I've found I feel best if I keep carbs low anyway, so I wondered if this would make any difference. Anyway, these cookies are good if you are avoiding any sort of sweetener. They taste good to me and I liked the spice taste. I stayed on the Keto diet for about two weeks, but I've got to say it's not easy. 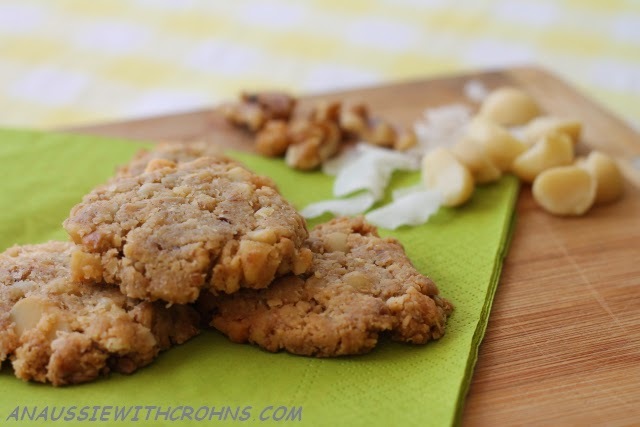 I think my body liked the low carb, but my tummy didn't like so many nuts. By the end of the week I was very tired. I lost a bit of weight to start with, but then put some on by the end. In conclusion, keeping carbs low makes me feel better, but going very low carb (no fruit or honey) doesn't agree with me. I found I kept wanting to eat Keto treats even though I was full. I find I'm satisfied with a smaller amount of treats if they have the sweet taste I'm craving. 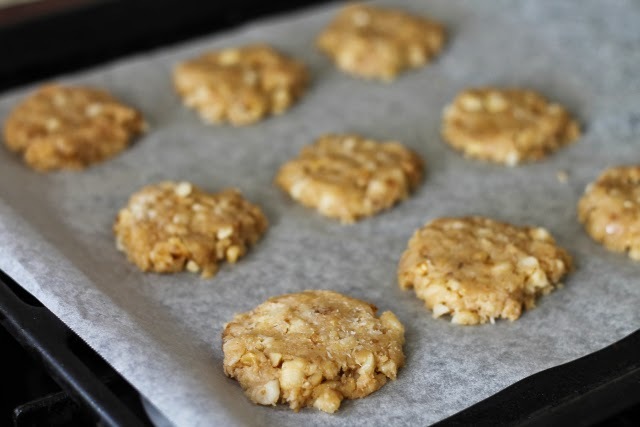 So I'll probably make these cookies again, but add in some honey and dried fruit. Combine the tahini and eggs in a mixing bowl. Roughly chop the walnuts and macadamia nuts. 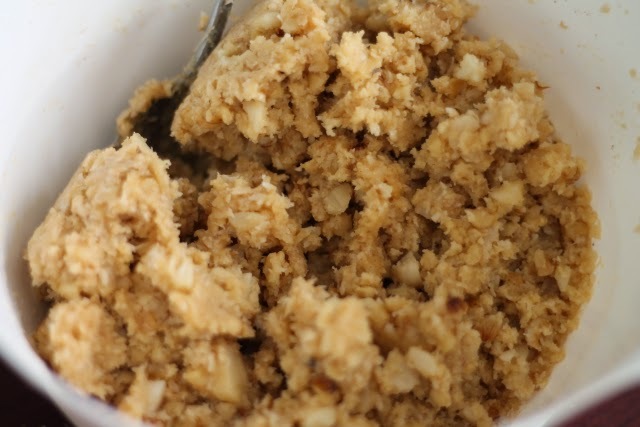 Add the chopped nuts, coconut and spices to the tahini/egg mixture and mix thoroughly. 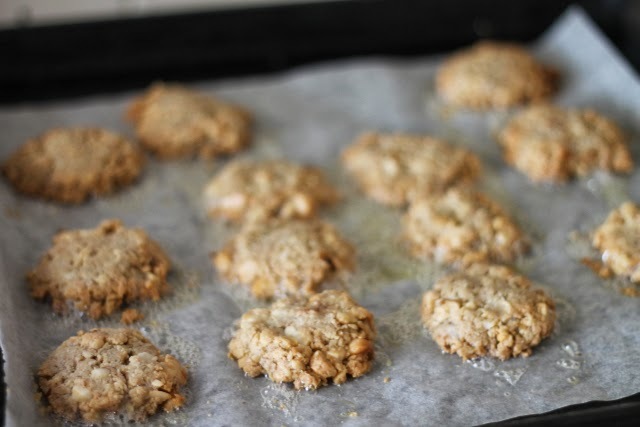 Scoop tablespoons of mixture onto the baking paper-lined tray, forming them into cookie shapes. (Shape won't change while cooking). Bake in oven for 10-15 minutes until lightly browned. Thanks to all those readers who've come and said 'Hi!' on Facebook. It's lovely getting to know you all. Walnuts and Almonds are very good, Maccas are a little expensive just now, but this is a good substitute. I just found your blog and love it already. :) I'm currently paleo keto and love it. Still in the transition phase, and once I got over the keto-flu (holy hell that sucked) I felt good!